The Tadi Brothers 7" Wireless Ultimate RV Backup Camera System with Double CCD RV Camera lets you to enjoy one of our most popular setups without the hassle of running wires through your car or RV. Installation is a breeze! Just connect it to any power source or cigarette lighter. Mounting hardware (included) lets you choose between windshield or dashboard mount. The lightweight, 7” LCD monitor provides crystal clear, panoramic views in rich color. It includes four video inputs to connect to multiple cameras, providing the choice to view one screen or all four in a single monitor. You can also hook up to a game system or DVD player, a feature offered in most of our products, and something you won’t find in most others. As with all our monitors, the 7” wireless LCD is compatible with the full line of Tadi Brothers cameras. Two side cameras and one rear provide an expansive 120° viewing angle. The side cameras are ideal for any long RV or bus, and can be mounted facing the back or front, offering the highest-quality views you need for parking or lane changes. Our specially designed compact size means you won’t knock them off in those tight, tricky spots! All cameras are waterproof and automatically adjust for night vision. The 65 foot wireless range will work in any vehicle. The Double RV Box camera offers incredible adjustability and night vision clarity. This model is very popular with RVs, because its housing allows you to install the cameras on multiple sides of your RV. With the CCD lens – the clearest and highest quality camera offered in the TadiBrothers line – you’ll be able to view the hitch and rear traffic at the same time, or set it to any custom adjustment you desire! The RV Box camera has a metal sun shield visor to guard against sun glare and road debris. It is without question our toughest built-camera, built to withstand impact from rocks or pebbles without getting damaged. For those who want more, the optional addition of a frontal camera converts this to a four camera system. Tadi Brothers products are world class and we stand by them 100%. Our tech team is available 24/7 to answer your questions. You always have our 30 day guarantee to return the item for an exchange or a full refund. 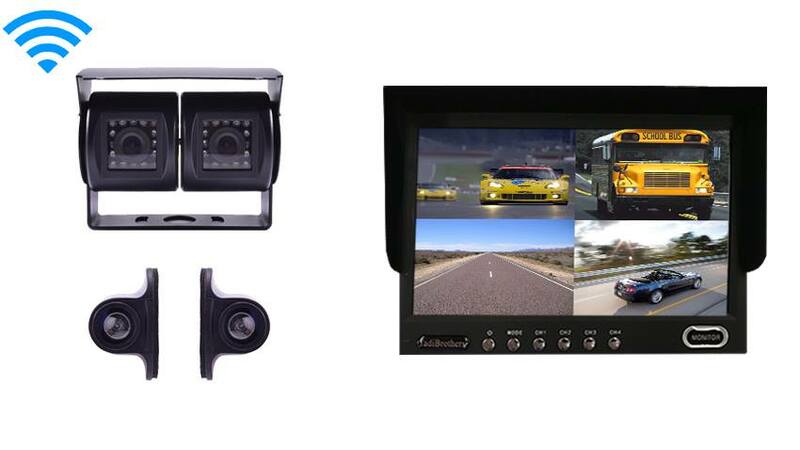 Order your 7" Wireless Ultimate RV Backup Camera System with Double CCD RV Camera today. "I have tried other less expensive wireless rear view safety systems and only Tadibrothers delivered the goods. This system has been clear when i off road and in VERY HOT temperatures i have no doubt that they have the best engineers designing this stuff because after 30 years a NASA i know good work when i see it"